For cocktail #2 from the Spamalot collection, I turned to the Python who appeared less in front of the camera yet whose illustration and animation defined a good part of the feel of Flying Circus, Terry Gilliam. Shake with ice and strain into ice filled old fashioned. * For Coke syrup, reduce Coca-cola over heat by half. 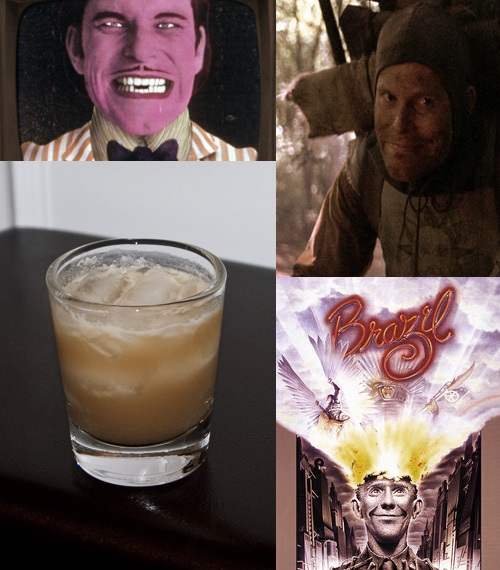 As Terry Gilliam has since Python days moved on to establish himself as a unique and talented director, I wanted to start with a base spirit that payed homage to that, and to his masterpiece, in my opinion, Brazil. Enter the sugarcane-based Cachaça, national spirit of Brazil. To this I added lime juice, following a similar path to a Caipirinha, but then added reduced Coke syrup for sweetness as opposed to sugar (and moving in the direction of a Cuba Libre). There is some thematic thread here as well. I wanted to take a distinctly American product like Coke, since Mr. Gilliam has that origin, and then throw in the lime for his later adoption of Great Britain as home (c’mon, you didn’t think I could get through six Monty Python cocktails without a single Limey reference, did you?). 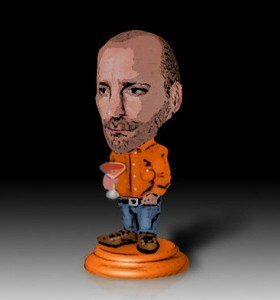 In addition, I wanted to represent his illustration and animation, a tough task for a drink. Then it came to me to flatten the carbonated soda, a nod to his 2D animation style. The cream of coconut, of course, is all Holy Grail. Imported by swallows, I believe.